Today’s episode features author of Jesus Untangled: Crucifying Our Politics to Pledge Allegiance to the Lamb, Keith Giles (Amazon affiliate link which means if you buy from this link Amazon sends a little my way). How integrated should the Kingdom of God and the leaders of a nation be? The question may seem strange to Evangelical ears when the objective of some for multiple decades has been to pass laws and “influence” political leaders. But just because this has been the case does not mean it is what ought to be. Here, I need to give you a confession: I’m a political junkie. I like everything about politics including the maneuvering, the process of elections – especially at the presidential level – and watched with fascination the 2017 inauguration of Donald Trump as president. I worked, talked, and voted as conservatively as anyone in the 1990s and 2000s. In fact, my first online experience was a blog about Christians in politics where I read and wrote about various policies and issues of the day. I even saw a Sarah Palin event once. So, I was invested in conservative politics, the Tea Party, and all that means. But the blog found little traction and I began to alienate friends with my views which I was willing to do for the right cause but was unsure I had found it. Then, one day, I read a book that changed everything for me. Free books was one of the main benefits of blogging and I received one by Os Guinness called A Free People’s Suicide. If you haven’t heard of it, that’s okay. Most people I talk to haven’t. But I love this book because it changed my life. You can click that link above to read my full review if you’d like but here’s the life-changing point that he made: The Constitution matters less than the character of the people because adherence to the first depends on the second. In other words, if Evangelicals want to change the culture they are far more effective changing hearts than laws. My views of God and the political process began to change as I sought for opportunities to offer positive value to both the American culture and the Evangelical subculture. Now, instead of yelling and arguing about which laws to pass, I sought heart-level connections with people. If you have been paying attention you will know where this is going. 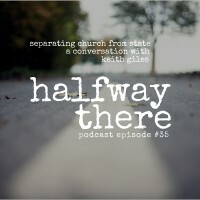 Halfway There tries to be that kind of positive voice that lets you into the real experience of becoming a Christian and learning to live life with God. It seeks to change our character into more trusting and faithful followers by sharing when God was faithful to others. It is about the experience not the theological category. And, yes, that’s the agenda I have in every interview which I’m sure longtime listeners perceive. 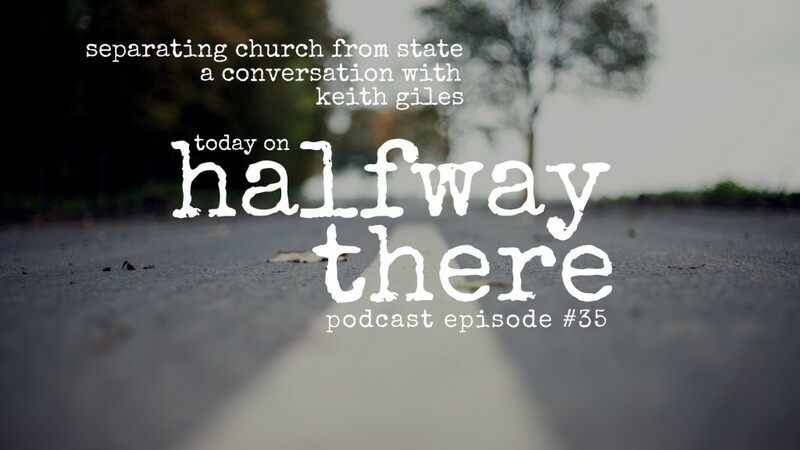 I tell this story not to distract from Keith’s story but to let you know that if our conversation about separating church and state is challenging for you, I understand why. That was me just a few years ago. But it also comes with an invitation to listen, consider what he says, and decide for yourself. We are constantly being asked if we are going be disciples or not. Whether you ordain me or not I’m going to live for Jesus. I’m going to follow him. The average Christian has more power to change the world than the president of the United States of America. We’re not doing nothing. We’re setting of nuclear bombs in the spiritual world. Did you relate to Keith’s story? Be sure to pick up Jesus Untangled for more. And tell someone you know who would enjoy Halfway There about the show. It’s the highest compliment you can give.